On Saturday, November 2nd at 1:30 p.m., a concerned resident of E. 246th Street called in suspicious activity of a male wearing a black hoodie entering the side door of a vacant house. Officers arrived on scene and commanded those inside to evacuate, which resulted in seven juveniles exiting the home. The K-9 Unit was called in to check for any additional people inside. Officers gave three loud verbal commands to exit the home or the K-9 would be deployed. The K-9 Unit, handler and Rocky, entered the structure and located a juvenile suspect hiding in a crawl space near the basement steps. During the apprehension, K-9 Rocky bit the suspect. K-9 Rocky was also punched and kicked by the suspect. 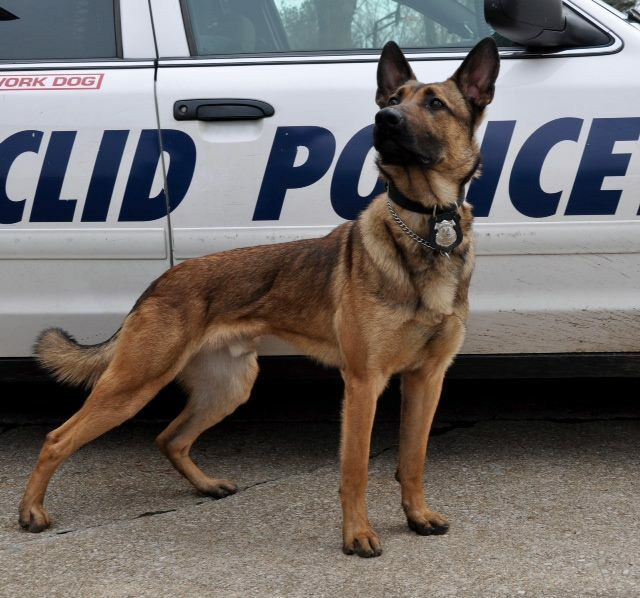 K-9 Rocky was transported to the veterinarian for treatment and is OK. All eight juveniles are charged with Felony Burglary, one is also charged with Obstructing Official Business, and one is also charged with Resisting and Assaulting a Police Officer. Thank you to the observant resident of E. 246 St. who called the Euclid Police for suspicious activity. Employing the strategies of Block Watch is a great asset to any neighborhood.